Chris Hughton admits Brighton's summer signings have not yet hit the levels required and are taking time to bed in. After staying up in their first Premier League season, the Seagulls spent almost £60m on 10 new players - but only winger Alireza Jahanbakhsh seems to have established himself so far. Martin Montoya and Yves Bissouma have dropped to the bench after initially starting games, while striker Florian Andone, who has been injured, is among three new players yet to make a Premier League start and defenders Bernardo and Leon Balogun have just one each. "I think it would be fair to say they haven't hit the levels required yet," said Hughton, whose side could go 10th with victory over Cardiff on Saturday. "They all have different circumstances. One is about the form of the players. In Florin Andone's situation he came with an injury and had a couple of little problems that stopped his progress being as quick as he would have liked. "Bernardo is a real talent at left-back and I think has got a bright future for us - but my choices have been a bit different and that can happen. "Of course if the team is doing well enough - and we have stated okay - you don't make those changes. But I fully expect the new players we brought in to play a big part this season." Eight out of Hughton's starting XI that lost to Everton on Saturday were part of the squad that got promoted in 2017 and they had helped the Seagulls to three straight wins before the 3-1 loss at Goodison Park. 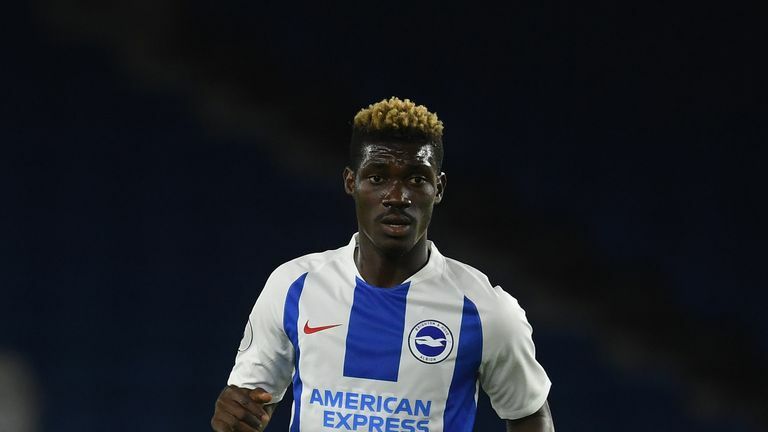 Hughton wants those players that kept Brighton in the top flight to help the newcomers settle and establish themselves at the club. "I think that's normal," he said. "The progress of new players can be down to so many things; a settling in period, how well the team is going, what position they play etc. "At the moment we have as competitive a squad as we have ever had. That's what we wanted." Catch Cardiff v Brighton with a NOW TV Sky Sports Day Pass - one-off payment just £7.99.